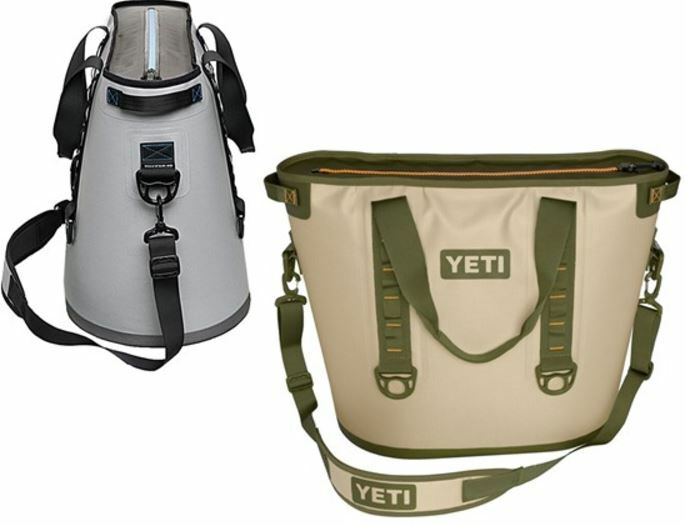 Right now select YETI Hopper 30 Coolers are on sale for $169.99 (Retail $349.99)! These will sell out fast! There are some adventures where we just want to grab our stuff and go. That’s where the Hopper comes in. It’s the first 100% leakproof portable cooler. We’ve engineered it the way we do everything — to keep ice for days and be tough as nails. So don’t call it a soft cooler — it’s anything but. The Hopper is loaded with features you won’t find on any other cooler and built to go the extra mile, whether that’s down a wild river in a kayak or on a floatplane trip to a remote salmon stream. DryHide Shell: Hopper’s high-density fabric is waterproof and resistant to mildew, punctures, and abrasion. The liner is made from a FDA approved food-grade material. ColdCell Insulation: Closed-cell foam offers far superior cold-holding to ordinary soft coolers. HydroLok Zipper: Borrowed from survival suits and hazmat protective gear to make the ultimate waterproof, airtight closure. HitchPoint Grid: Easily attach pretty much anything to your Hopper. Bottle openers, carabiners, or accessories like the YETI Sidekick Gear Case. Double-Stitched Carry Options: With a detachable shoulder strap and three different sets of reinforced handles, you’ve got options on how to make the load easier to carry. Bonus: $5 flat rate shipping available site wide through Cyber Monday!